From February 8th to the 17th, clowns, magicians and acrobats will take over RIVER WEST and an amazing carnival party begins for all of you! From February 8th to February 17th, RIVER WEST enters the Carnival era and “surrenders” to the whimsical atmosphere and the great miracles of the circus! Beloved circus heroes will give their own magic show in a festive setting that will leave our young visitors starstruck and smiling. On the first level of RIVER WEST, modern age clowns will transport you into the magical carnival atmosphere, in a unique, colorful setting resembling a real circus. Music activities, a balance beam, hula-hoops, stilts for kids, juggling and strolling around with clown shoes are just some of the activities that children will have the chance to play and enjoy. 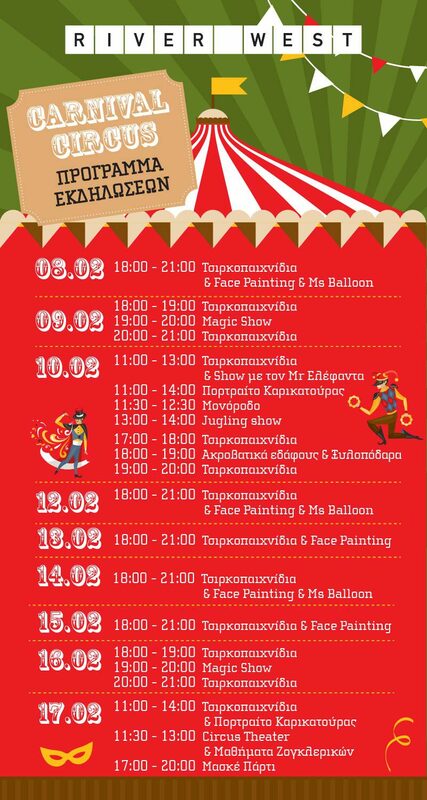 The Circus show will be complemented with the unstoppable jugglers, hilarious clown performances, acrobatics, music and tricks but also juggling lessons for our young guests. Around the circus, Ms. Balloon will offer her incredible balloon-creations while the young visitors will be able to enjoy face painting, the one-wheeled cyclist and of course get masqueraded to join the circus spirit! In addition, sketchers will make portraits of those courageous enough to see their caricature on the paper. On Saturday February 17th, the heroes of the circus will suit up just in time for a carnival celebration and are going to welcome our young guests in disguise for a fancy dress up party. The DJ will be playing fun music and the carnival party will begin. Many games and activities, contests, sketches and lots of dancing will take place in a party that will be completed with the impressive masquerade parade that will spread all around RIVER WEST creating the best carnival atmosphere ever seen in a mall! Finally, on Wednesday, February 14th, on Valentine’s day, the archery’s and ballerina’s lovestory will be revealed through a clever and moving theatrical sketch!